Rumors have suggested Apple's upcoming 6.5-inch OLED iPhone, which can be thought of as an "iPhone X Plus" device, will feature a screen resolution of 2688 x 1242 with somewhere around 450 pixels per inch. Comparatively, the current 5.8-inch iPhone X features a screen resolution of 2436 x 1125, and the second-generation device is expected to use the same display. As with Apple's plus-sized iPhones, the extra screen real estate of the larger 6.5-inch device will enable an iPad-style landscape mode that offers up more available information in apps like Mail, Contacts, Calendar, and Stocks when viewed in landscape orientation. This has been confirmed in data gathered by Brazilian site iHelpBR from the most recent beta versions of iOS 12 and Xcode. The site forced the iOS Simulator tool to run at a resolution of 2688 x 1242 with a PPI of 458 and found that many native apps have been adapted with landscape mode features appropriate for a larger device. 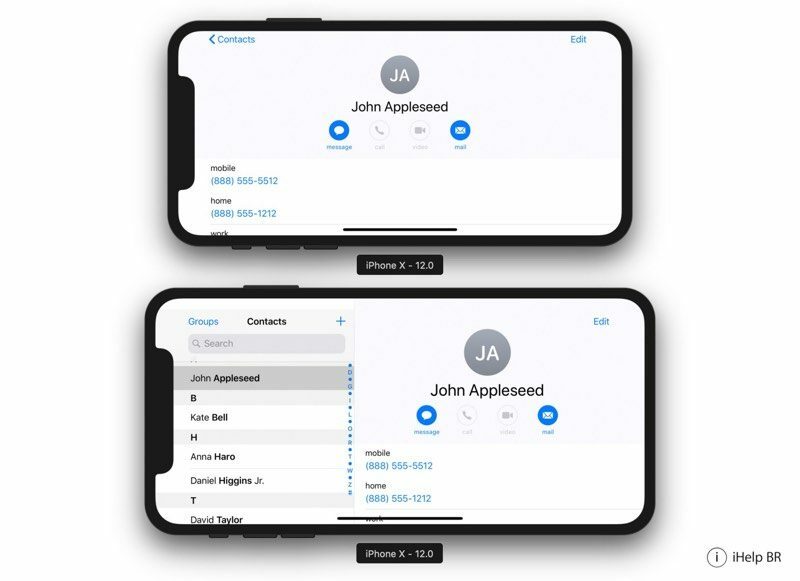 In screenshots, the Contacts and Calendar apps, for example, both feature iPad-style layouts that are currently used in plus-sized devices like the iPhone 6 Plus, iPhone 7 Plus, and iPhone 8 Plus. This suggests that Apple plans to treat the "iPhone X Plus" as it does the other larger-screened Plus devices, taking full advantage of the extra display area, and it also confirms that the upcoming device is likely to use the rumored 2688 x 1242 resolution. 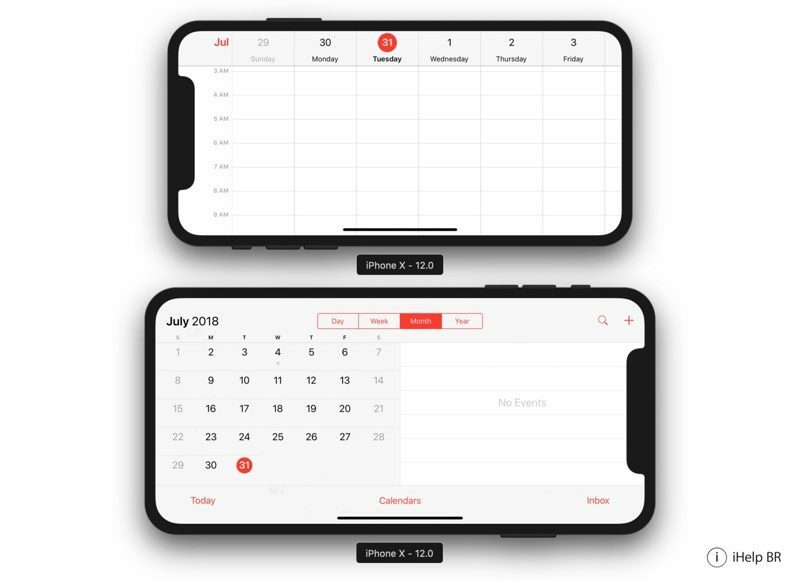 Apple first introduced the new landscape mode features in iOS 8 alongside the release of the iPhone 6 Plus, the first larger-screened Plus sized device that Apple launched. Since then, the feature has been limited to the larger iPhone models. Though the iPhone X's 5.8-inch display is bigger diagonally than the 5.5-inch display of the iPhone 8 Plus and prior plus-sized iPhones, it did not adopt the iPad-like landscape mode features. This is already a thing on the 6/6s/7/8 plus. I always wondered why it wasn't a thing on the X. I guess this is the answer. They wanted to keep it exclusive to the plus model. God that notch looks terrible in landscape mode! I know lots of people say 'you get used to it' and it isn't a problem. I believe you. I do. But I really think it just screams 'un-Apple like compromise' every time I see it, and seeing it like that in a landscape app mode seems... even worse to me. I just hope they eliminate it as soon as they can. Good news about more landscape mode though. Looking forward to Android folk going on about how they've had this for years. Still no side-by-side multitasking for apps....still hoping they announce that feature. That and picture & picture for things like video and even FaceTime. I'm really tired of anytime you leave the FaceTime app during a video chat, it pauses the screen. Expected, but still a welcomed rumor. One of the things I missed most about going from the 7+ to X. After a 6 plus, 6s Plus and 8 plus, I gave up on the iPad style landscape mode for these larger phones. After all these years they have dragged their feet on bringing this across the board with popular apps like Phone and Music.